Navigating through life is hard at times, as you are faced with difficulty and uncertainty that it ushers in — life is known for the lemons that it so willingly and freely gives. Have you ever noticed those that can take setback after setback with enough lemons to grow a tree and with the weight to seemingly crumble, yet they turn it into something so beautiful and incredible? 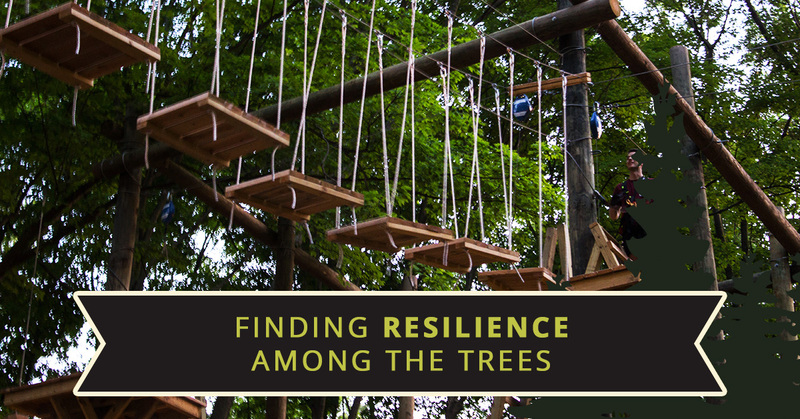 If you’re living life searching for ways and skills to better help you navigate your experiences, TreeRunner Raleigh is a great place to find and learn resilience amongst the trees! Read along in today’s post about how learning to be resilient can benefit anyone, young or old, to live a healthier more productive life! Resilience, simply, is the ability to bounce back after hardship. This is any experience from getting a failing a grade or not making the team to receiving a bad work review or not getting the promotion; it is the place where a sense of failure begins to brim. Being resilient, then, is overcoming these failures and continue moving on despite the obstacle. Resilience doesn’t mean people never have hardship or difficulty, but it’s taking these narratives and emotions and funneling them so you can bounce back and overcome them more quickly. How Can TreeRunner Raleigh Help Cultivate Resilience? Encountering hardship – Hardship comes in all forms to all people, and how someone experiences it is unique to that person. When you participate in a treetop adventure with us, you may find small bouts of adversity along the way. 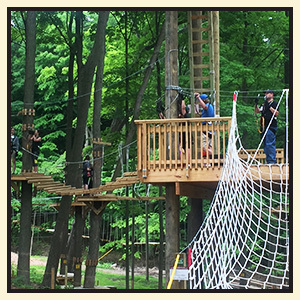 Perhaps you have a fear of heights or you don’t think you have the stamina to complete a course; TreeRunner Raleigh gives you the safe and supportive environment to build resilience. Activity – People who are more active and get regular physical exercise enhances your ability to build resilience. Activity gives you better mental toughness and contributes to better emotional resilience. When you’re high amongst the trees on one of our courses not only are you getting physical exercise, but you’re working through obstacles. Finding a purpose – It has been shown that people with a purpose or those who can find a “why” and “how” in situations are more resilient. Being at TreeRunner Raleigh and journeying through each ropes course gives you the opportunity for a purpose; you have a starting point and an ending point and in the in-between, you have to figure out how to complete the task at hand. Helping others – Helping others can seem counterintuitive when you’re trying to build resilience, but it can be empowering to all people involved. Not only are you helping someone by showing them a new way tackle a certain problem on the obstacle, you’re then empowering them to do the same. Instead of feeling helpless, you’re being helpful. Being in a supportive environment – Being able to work through difficulties with people, like in a treetop adventure, you have to communicate both to and with your team or friends through problems. It requires everyone to be open and honest and it involves a great deal of trust. When you’re in a supportive environment with people who are willing to help you through your tough situation, resilience is better built. Are You Ready to Build Resilience in a Safe and Enjoyable Way? No one will ever live a life free from difficulty or hardship, so building resilience is a crucial life-skill to have, and why not work on it with some of your best friends or office teammates in an incredibly fun environment amongst the trees? Book with TreeRunner Raleigh and engage resilience through obstacle problem-solving, getting physical activity, finding your “why” and “how” throughout the course, helping those around you while empowering yourself, and surrounding yourself in a supportive environment. Is There Too Much Adversity in a Treetop Adventure? TreeRunner Raleigh is the perfect place to build resilience in a safe and effective way, and there is never too much adversity placed on you! You will be tested both physically and mentally but the mood and the energy of the park is never taken too seriously, and you can tell us if you need help. At TreeRunner Raleigh, our park has three different obstacle course options that keeps things fun and light-hearted, all while being able to progress! Work with those around you and lean on our awesome staff as you sharpen your resilience skills! Book an aerial adventure with us today and begin to build resilience amongst the trees!